For home-front America, World War II was a time of shared sacrifice, when people gave up simple pleasures to support those fighting overseas in the greatest struggle the civilized world had ever known. After the war, though, society breathed a collective sigh of relief and went out looking for a bit of fun. 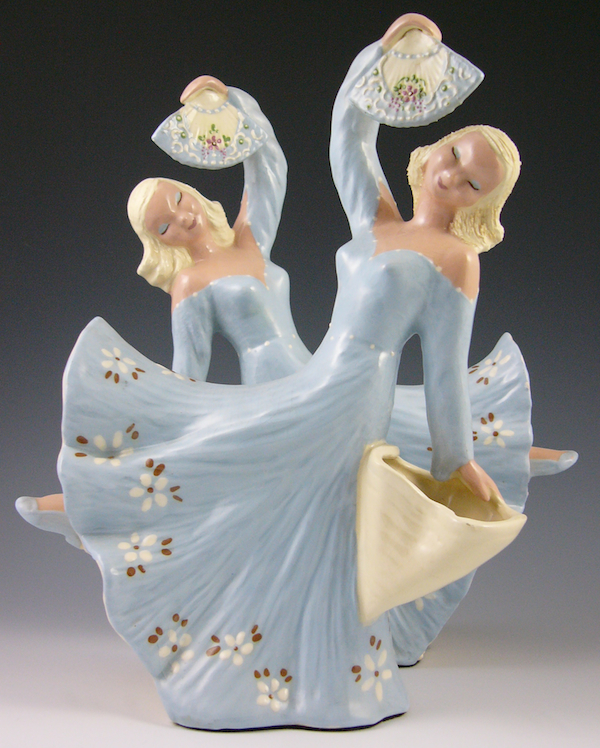 Above: Hedi Schoop’s “Blue Dancers” were sold as a pair. 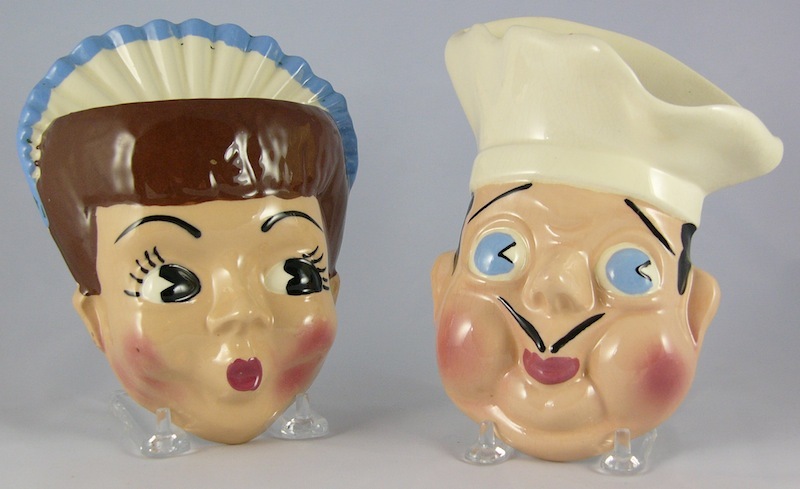 Top: Marie the Maid and Antoine the Chef wall pockets by The California Cleminsons. 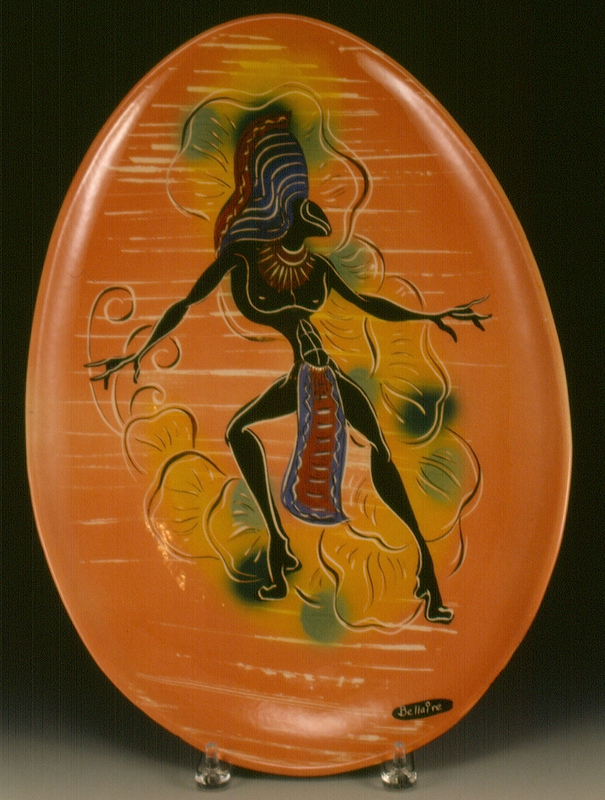 Coincidentally, some of the most influential figures in what Johnson calls postwar pop pottery were named Betty. 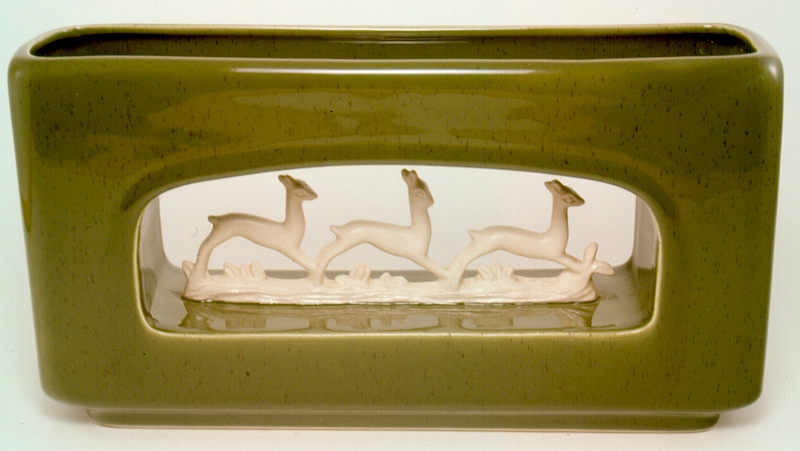 Between 1941 and 1955, Betty Harrington designed nearly 1,000 different objects for Ceramic Arts Studio of Madison, Wisconsin. Beginning in 1943, Betty Cleminson and her husband, George, sold their homey and heartwarming work as The California Cleminsons. And Betty Lou Nichols, considered by Johnson to be the queen of head vases, began her career in 1945 in the backyard of her parents’ La Habra, California, home. 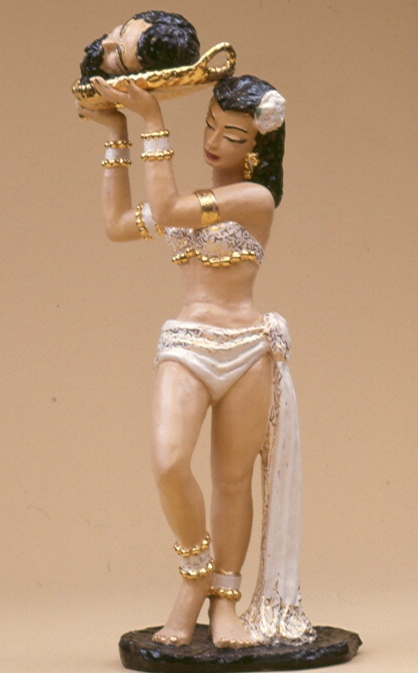 Schoop’s slip-cast figurines were often clad in long, draping garments, their heads tilted to the left or the right to give them a coy expression. 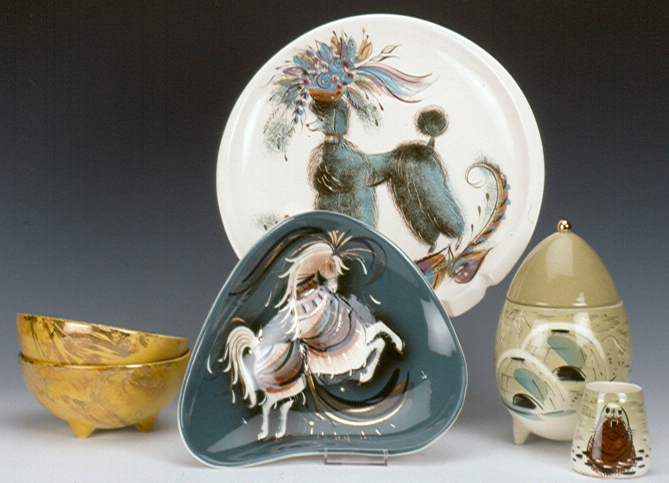 Many of her characters were taken from European sources—there’s a Tyrolean girl in yellow, a Dutch brother and sister in blue clogs—while others are clearly Western riffs on Asian sources—a pair of Siamese dancers wear blue pagoda-like hats on their heads, while the “Oriental” musicians on the front of an oval vase suggest the graphic approach used by artist Mary Blair for Disneyland’s “It’s a Small World” attraction. 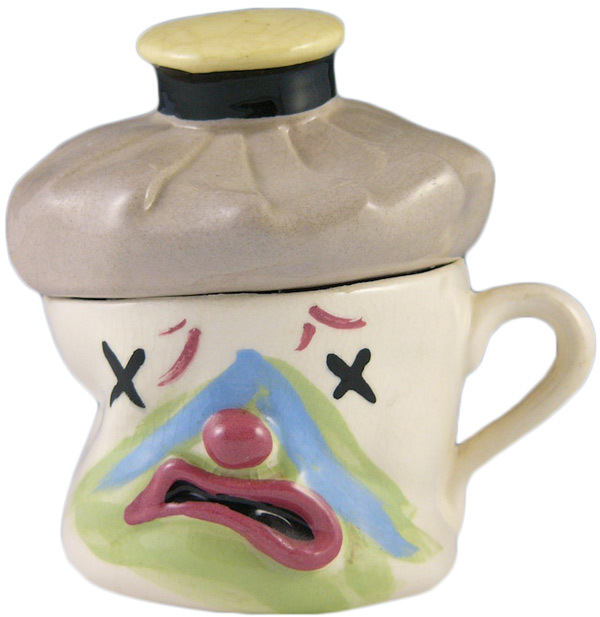 A “Morning After” mug by the California Cleminsons. 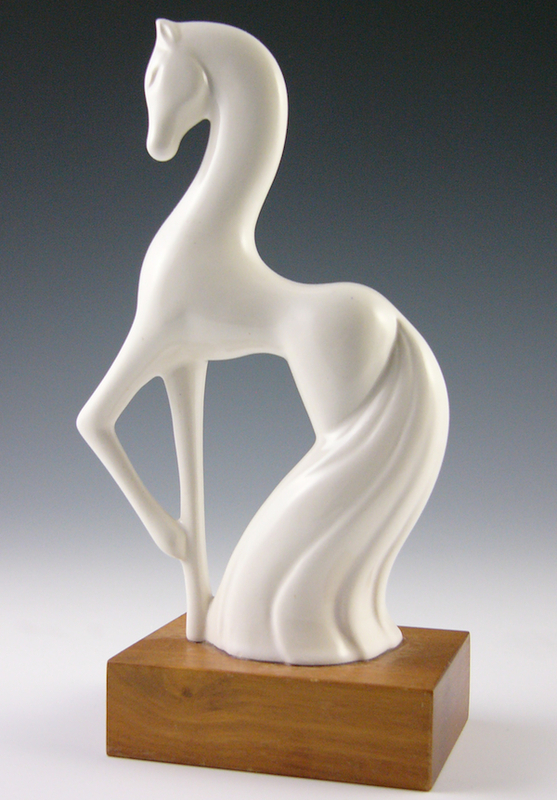 Roselane figurines, like this one called “Fantasy Horse,” are known for their elongated limbs. Howard Pierce’s figures were sometimes incorporated into planters. Sascha Brastoff was a consumate promoter, whose work was collected by Hollywood stars. Marc Bellaire was a protege of Sascha Brastoff, and an eventual competitor. 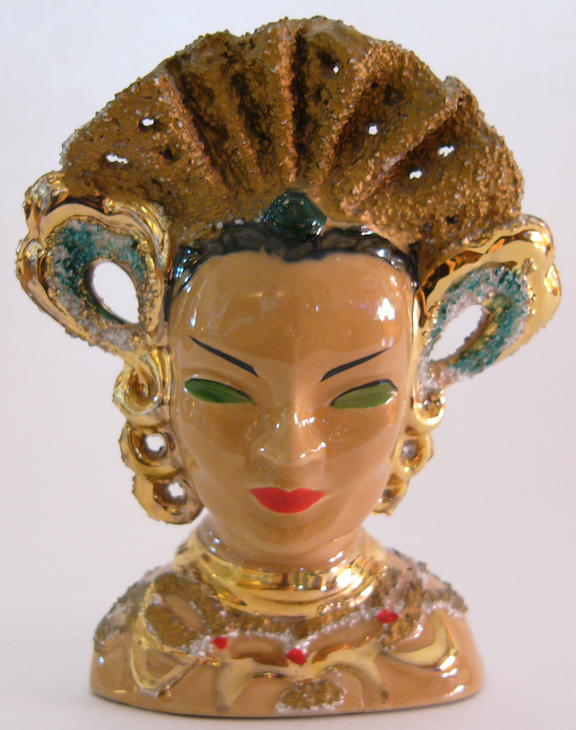 “Mary Lou” is a classic Betty Lou Nichols head vase, with thick eyelashes and lots of breakable edges. “Tyrolean Girl” by Hedi Schoop featured two baskets for flowers. 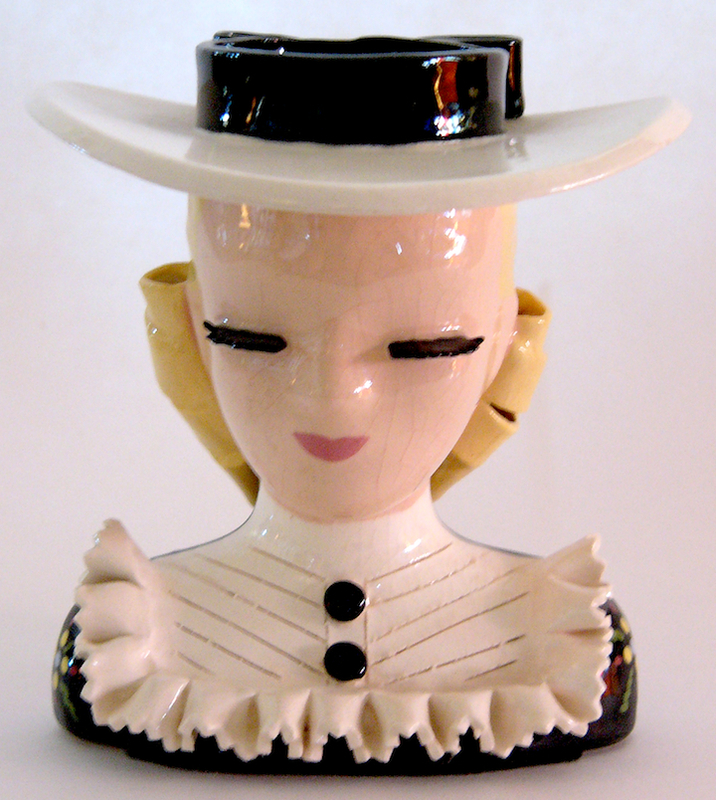 By the 1950s, head vases such as this one designed by Kathi Urbach, were being imported from Japan by companies like Ucagco. Other collectors only acquire certain types of head vases, like ones that have bouffant hair, or a female figure with one hand held up by the side of her face. “There are all these subtle delineations of the head vase,” says Johnson. “I’ve been to some head vase collectors’ homes, and it can be a little daunting because every place you go there are shelves filled with eyes looking at you. very very nice and great posting!!! I enjoyed yor article. I have collected Cleminson Pottery for some time and would appreciate any additional articles, resources, info that you might be willing to share. I am researching work by Kathi Urbach, and found this essay interesting. She was my godmother. Excellent article, learned a bunch. Thank you! Nicely done . I enjoyed reading this Ben . The younger generations wont use bar soap cause its icky, they certainly dont wanna DUST all these tchotchkis…. BUT at the same time, they have replace this stuff with Funko Pop and Star Wars figurines! “ ” When the first tattoo shops opened in the late 1800s, they were already old-fashioned.